Here you can find some video tutorials for the Title Manager product. 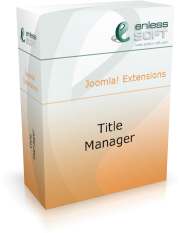 This tutorial presents the basics of the Title Manager product. You will understand the concepts of title pattern and title item and how this concepts are used to easily control titles in your Joomla web site. In this example, the titles of all article pages are changed to display not only the name of the article, but also its section and category. In this tutorial you will understand how to create a custom title item. You will also see how to define a default starting/ending of the title for all pages in your web site. In this concrete example, the name of the company that provides the web site is inserted in the titles of all pages in the web site.